For the author, this book is meant to be a wake up call to the ignorant consumers of the world. Ben Goldacre is an Oxford alum and psychiatrist who believes that pharmaceutical companies and prophets of alternative medicine are just taking us for a ride. 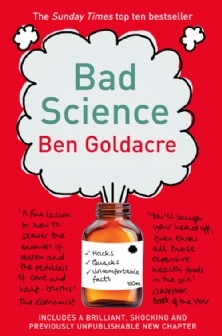 The book is based on his weekly column in the Guardian (also titled Bad Science). It has spent time in the top 10 on Amazon and was shortlisted for the 2009 BBC Samuel Johnson Prize for non-fiction. For more information on Ben Goldacre (he gives free speeches if you’re willing to pay his transport costs…) and his fight against bad science, visit www.badscience.net. Without giving too much away, the main tenet of Bad Science is homage to evidence-based science. Evidence-based science is that which uses the current best evidence in making decisions. In the simplest terms, it means science that can be backed up with real, meticulously reviewed, facts. When it comes to many things that modern society holds dear – fad diets, miracle cures, anti-ageing cosmetics – evidence-based science takes a backseat to clever marketing. Ben Goldacre, a self-professed ‘nerd evangelist’, attacks the quackery of products that are marketed to an unsuspecting audience with no evidence to back their amazing claims. Among his targets are homeopathy, anti-ageing moisturisers, Brain Gym, detox, nutrition therapists, and the media. Apart from making fun of the more asinine alternative forms of medicine, Goldacre also discusses the importance of knowledge when it comes to your own health. In particular, he explains in quite simple terms how medical trials are conducted and how the results can be interpreted in order to make them more favourable for public consumption. While being both humorous and cutting, Goldacre makes us think twice about trusting someone else with our health. As a medical student, this book appeals to me on a deeper level than it might a person with no health-related background. The evils of misguided quacks that Ben Goldacre explores are the same that (real) health professionals today have to deal with. If everyone had read this book before trying a new pill or diet, it would sure make life easier for their doctors. Although it could easily be a 300-page rant about the stupidity of the modern consumer, Bad Science instead manages to be empowering to the reader. Some of his examples of bad science are downright hilarious. I particularly enjoyed the test to show that Aqua Detox was a load of hokum (Detox and the Theatre of Goo, pg 8). Goldacre also touches on some genuinely scary results of bad science. He attacks Gillian Keith, the Scottish nutrition guru, who claims to have a PhD and be an expert in nutrition. Hundreds of people follow her advice, which includes basing your diet on the location of your acne. He also criticises the media for over-simplifying medicine to the extent that facts become distorted. If you have a parent/partner/friend who just loves doing detox, or buying collagen-infused face creams, or thinks vaccination is useless – I suggest buying them this book for Christmas. If you are curious about how you’re being made a fool of without even knowing it, or just want to have a laugh at people that are, then this book is a must-read. It’s funny, interesting, thought-provoking and uplifting. Trust me, you won’t be disappointed.